Have you ever imagined you step out of your back door to lay your hands on fresh strawberries and red currants to add flavor to your breakfast every morning? Do you even think it’s possible to gather salads and eatable flowers to prepare a big bowl of salad for lunch? Or ever imagined being able to collect fresh vegetables just a few stone throw away from the kitchen door each evening to spice up your supper? This is the lifestyle I was used to in my old house before we moved into a new apartment in a new town. In our small garden (just 30x25ft), we used to harvest various kinds of vegetables, herbs, fruits and edible flowers. For me to have gotten such a bountiful and various yield from such a small-spaced garden, I used some very helpful permaculture tips, which I can also recommend for you. It’s funny to have this thought in mind that despite all human achievements, our existence still depends on a-six-inch layer of topsoil and the fact that we have rainfall at regular intervals. I can say that soil is everything; if there is no soil, we wouldn’t be able to grow our foods, and having a rich, productive, and deep soil is the key to bountiful yields on your garden. I got a good deep soil in my garden by creating two 5x5ft beds raised to a height of about 2 feet by using reclaimed scaffold planks and placed them in that portion of the garden having more sunlight. I filled them with a bottom layer of wood chip; I then mix it with top soil and manure. At first, the wood chip was only used to help build up the biomass, but I later noticed that as the wood chip broke down, the mycorrhizal fungi in the wood spread throughout the beds, transporting nutrients to the roots of my vegetables as it went. This really got me excited as it helped to improve my garden yields. Once these beds were made, I avoided walking on the soil so that it did not become compacted, and I never had to do any further digging on the soil, so that the worms and micro organisms will do their job by channeling and transporting air and nutrients to the plant roots. I also prepared my own compost from my kitchen wastes and chicken dung, and used this compost as mulch on each of the beds at every spring and autumn. Doing this regularly made me to add more nutrients to the soil to give more yields during harvest time. From these 2 small-sized beds, I had a good harvest of vegetables throughout the year to complement my family meals. The shape of your beds can influence your yield. If the raised bed looks like a dome with sloping sides, you are successfully gaining more surface area to grow more crops on the same path. For instance, if the bed is 5 feet wide across the base, it might give you a-6-feet arch of soil. This will as well give you the opportunity to make little micro-climates that are favorable to certain crops. Some prefer more shady areas during the day, while others love it under warm sunny conditions. When I had the chance to make a new bed in my garden, I chose to make the bed like a dome shape, with old bits of chestnut on the edges to help hold the soil. Along the south facing edge, I planted asparagus, on the northern edge I planted wild strawberries, and in the relatively domed middle, I planted annual crops like beans, kale and chard. The wild strawberries grew well, and were easy to pick because they leaned out into the path, and I also enjoyed good yields of chard and beetroot in summer and kale throughout winter. The asparagus was still quite young when I moved to a new location, so I cannot be 100% sure that I would have had plentiful yields from this crop; even in its young state (just 2years old) I got a modest yield. Another example of growing crops in domed beds, as developed by Sepp Holzer, is called ‘hugelkultur’. This is a means that helps to increase fertility of the soil by piling up huge amounts of biomass on the surface area which will ultimately bring about bountiful yields on a relatively small-spaced garden. The conventional way of growing vegetable crops are done in rows, but this does not allow you to utilize your little space. No row occurs naturally, you just have to properly utilize any bare ground that appears free and fill the space with plants in a tessellating manner. So to imitate this and to get maximum output, it’s best to sway your plants by arranging them in triangular forms. For example, when I planted out broad beans and the packet advised me to leave 9 inches between plants, using a dibber, I marked out a triangular pattern leaving the corners 9 inches apart and planted each bean in the holes. The method earned me around 10% more crops in the same amount of space. I’ve also learned over time that packing plants so tightly is not too ideal, as the plants will have to compete for nutrients to reach their full size, and as well be exposed to threats from pests. In my raised beds, I nurtured vegetables such as peas, beans and cucumbers up poles or trellis so that I could have little space in between to plant more of lower growing veggies such as salads, chard or beetroot. In the remaining part of the garden I cultivated fruit trees, shrubs and climbers, imitating a natural forest with its different layers. For instance, I planted strawberries on the layer below, currants and raspberries in the shrub layer, and apple and pear trees in the canopy. I also grew wine berries, loganberries and bayberries, all leaning on the fence, and I used hanging baskets and grew strawberries inside tall pots. *Climbing beans with nasturtium spreading across the ground between them, which helps attract black fly away from the beans. *Sowing radish and parsnip together so that I can harvest the quick yielding radish before the parsnip gets going. *Sowing blocks of carrots and onions together so that the onion smell deters the carrot fly. *Creating a jumble of various herbs and veg together to create a Polyculture to confuse cabbage white butterflies and other pests. With successional planting you can grow more than one crop in the same space over the course of a growing season. My experience of the UK climate (living in the South) showed that I was able to grow up to three different crops in a single area over the course of a year. For example I would start with an early crop of Purple Podded Peas, followed by a quick crop of Summer salads, then in Autumn I’d sow a crop of Broad Beans to overwinter. The trick is to use fast maturing varieties, or sow lots of things in modules so that they are ready to go as soon as they are transplanted, and to replenish the soil after each crop is harvested with a fresh mulch of compost. Getting to know your garden’s micro-climates helps you to find the best spots to grow crops for a longer growing season. I put my raised beds in the sunniest part of the garden so that it would warm up faster in Spring and stay warm for longer in Autumn. 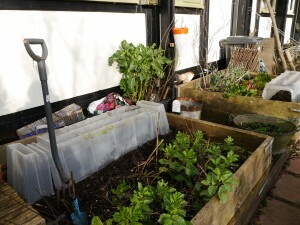 Other ways to extend the season include using a cloche over your crops to create a more sheltered environment, and growing seedlings in modules on a windowsill or in a cold frame so that as soon as the weather is warm enough you can plant them out and grow them on quickly, ahead of those sown outdoors. Putting black plastic over the soil in nearly Spring helps the soil warm up quicker so that warmer loving crops do better, sooner. I didn’t have space for a polytunnel or greenhouse in my small garden, but one day I’d love to have one so I can extend the growing season even further. It also helps to get to know your plants. I discovered that a variety of kale called Ragged Jack (also known as Red Russian) was an ideal crop to overwinter, and as soon as the days started to get a bit longer in the new year it would reward me with an abundance of new leaves and tasty flowering shoots, a bit like Purple Sprouting Broccoli. I also discovered a perennial broccoli which was very quick to produce white florets in early Spring. Perennials are very useful in the garden because they yield greater quantities year on year, and are quick to get going early in the season. It’s always nice to harvest rhubarb and red currants, when other annual crops are still in their modules. Sorrel is useful perennial that I enjoyed harvesting for early salads. I would have liked to have Ransoms (wild garlic) growing under my fruit trees as they yield delicious leaves and flowers in early spring before the canopy closes, but alas I had no room. Perhaps I’ll try growing them in my new garden? You can increase the value of your yield, by choosing to grow crops that are expensive to buy in the shops, such as organic asparagus, blueberries, potatoes and tomatoes, This means that each handful of crop that you harvest is worth more in terms of cash value, saving you more money in the shops – and there’s something rather satisfying about that! It’s also rather satisfying to be able to harvest things super-fresh, such as salad leaves or raspberries that quickly deteriorate when bought in plastic packaging. And it’s hard to put a price on a prickly cucumber still warm from the sun, and a variety that isn’t even available in the supermarket. This is a permaculture principle that amuses me, and stretches my mind to see the garden as more than a set of crops to weigh out in the kitchen. Permaculturists tend to argue that there are other slightly less material yields to be found in the garden system. For example it’s hard to quantify the enjoyment I get from watching it grow and how this feeds my sense of wellbeing, or how it provides me with gentle exercise while enjoying the sound of birdsong, or how sharing a glut of courgettes can help build community relations! These can all be counted as a yield and I find it fun to think of life in this way.